When you think of radio pirate, most likely what comes to mind is a rogue, unlicensed transmitter that is re-broadcasting copyrighted material, syndicated shows, etc., on radio or television. Nowadays that would also include the Internet as a medium. Did you know that, at least decades ago, the British government (and maybe others) charged citizens a fee for listening to broadcasts on their household radios? That's right, if you wanted to listen to the BBC, you would kindly remit a fee of 10 shillings ($2.50 in U.S. dollars at the time) per year. Otherwise, you were apt to have government inspectors descend upon you and padlock your radio set - or collect the requisite 10 shillings on the spot. After a growing number of suspected dishonest British subjects finally exceeded the reasonable level of tolerance of the government, a clever scheme was devised to trick evil citizens into divulging their nefarious crimes. Author Austen Fox does a great job of telling the tale. 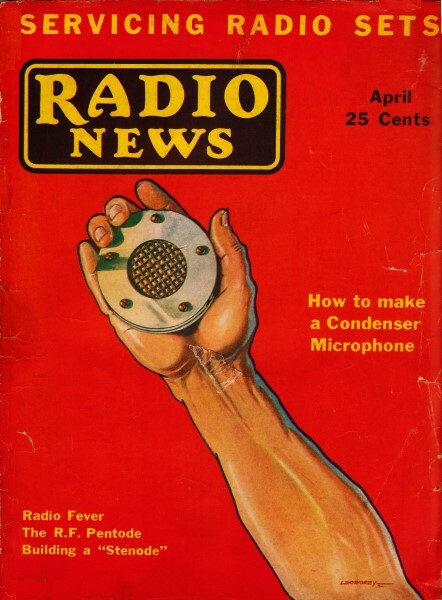 The stunt would make a good candid camera ploy for a good laugh today, but in the 1930s when radio waves were mysterious and even feared, it was a dirty trick to play on the good people of England. The American government long ago solved the problem of collecting mandatory sums for state-run public radio and television broadcasts with tax dollars withheld from your paycheck before you ever see it. The "flying squad" leaving the post office to find the 400,000 radio "pirates" estimated within the London area. 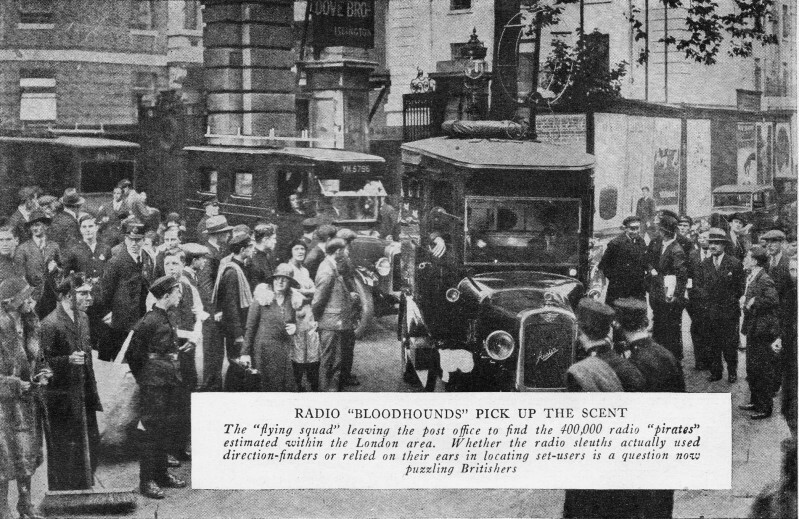 Whether the radio sleuths actually used direction-finders or relied on their ears in locating set-users is a question now puzzling Britishers. The British Post Office has just "put across a hoax" on its trusting public which would make Tammany blush for shame - or, what is more likely, turn green with envy. 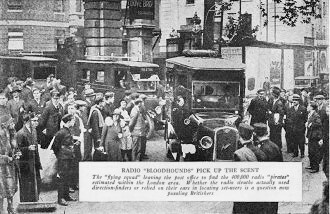 It all has to do with the affair of the detective "radio cars" created for the purpose of tracking to their lairs "pirate" radio listeners throughout the British Isles. As everyone probably knows, the British radio receiving-set owner must obtain a listener's license at the rate of ten shillings ($2.50 at par exchange) per year. Otherwise he is apt to have government inspectors descend upon him and padlock his radio set - or collect ten shillings. There is, of course, no danger of getting into jail for bootlegging radio programs over there - not any more than in America for running an "alleged" speakeasy. But the British public as a whole is essentially honest. They go down and buy their licenses at the local post-office because they feel that a government decree or order is made to be obeyed. It has apparently struck them that it is entirely fair to expect them to pay a small license fee, a part of which, at least, goes to the monopoly company maintaining their broadcasting programs. They prefer this to advertising; they feel that they get better programs by such independence from commercialism. In this they are evidently more or less right. At least they do not have to get up every ten minutes to tune out some long speech about the advantages of Pale Pills for Pink Toothbrush, as most of American radio listeners do. After some time, the General Post Office, however, began to grow suspicious of its honest public. The statistics on sales of receiving sets, parts, etc., did not seem to jibe with the number of listeners' licenses taken out. There were too few of the latter; anyway, some cynics started whispering nasty innuendos about human nature, and all that. With true British caution, they did nothing for a while. They carefully looked over the ground, and discussed the problem from every angle. The general and the radio press likewise discussed it. Nothing came of the fuss, and the Post Office, like Br'er Rabbit, lay low and said nuffin'. The pirating of programs went right on as before. After all, what could they do about it? To maintain a great corps of inspectors would cost more than it was worth. To send a few here and there to catch and punish offenders might be partially effective, but it left the field pretty well uncovered. To spot the pirates otherwise seemed to be just an engineering impossibility. Suddenly, during the Fall of 1931, the radio public of England was awakened with a violent shock. The Post Office authority published an announcement, which was taken up - and given plenty of space in the daily and the wireless press, that they were "out to get" these license dodgers, and no fooling about it either. They did not mince words - they said that it was just so much dishonesty, and that they would deal summarily with anyone caught. They were tired of letting fifty to one hundred thousand people sit around enjoying these programs on which the British Broadcasting Company had labored so long and lovingly, all at the expense of the honest people of the island. Being truly British, they were sporting about the warning. They told the people just when they were starting off on their crusade of reform, and they also told just how they were going to achieve their results. A broadcast from the British Broadcasting Company studios, and a broadside in the press opened the war. On a certain fateful day, named and dated exactly in this year of Our Lord 1931, two or more heavily armed vans (trucks) would set forth, manned by grim, determined engineers, who would stop at nothing (except the houses of pirate listeners), and one after another would bring these evil-doers to justice. The vans were to be armed with everything of the latest in radio direction-finding apparatus, ultra-sensitive and extra-accurate. They were to cruise the streets of London and the suburbs at first, and then go on to other localities. Dark and mysterious would be their movements, they would come with a blast of trumpets, "alarms and excursions off stage". In other words, they would not sneak into a town and catch these good people unaware. They would give everyone fair warning when they were about, and it was just too bad for those who failed to take advantage of this fair play and get their licenses in the meanwhile. They would not question any license which might show a more recent date than the radio set-but Heaven help the poor soul who had none! For a week they operated with the grim efficiency of Scotland Yard closing in on a band of criminals, while whole veins of shivers ran up and down the British radio spine. It was found, said Post-Office authorities, giving out communiqués as from a battle front, that the morning was the best time to work, when the husbands were away and the wives were whiling away their housework hours with gay melody. Not three days after the opening of the campaign, there appeared in both the London newsreel theatres - one on Charing Cross Road, the other on Shaftesbury Ave., in the West End, pictures of these wonderful automobiles at work catching pirates. We were shown the inside of the "van," filled with lovely direction-finding sets, wheels, and gadgets. We were permitted to see the engineers actually track down a set, and went with camera right to the front door of a house, where the inspector rang the bell, asking to see the license of the householder; and when the good wife admitted, with very evident embarrassment in the face of the camera, that there was no license, she was politely but firmly warned that His Majesty's Government would find themselves obliged to proceed against that family to the full force of the law. There we had the working of this new policing system displayed to us in brief, convincing form. The vans moved on and ever on. They were announced in Richmond, in Westminster, in Mayfair, in Acton Town and Poplar - and the citizens of each of these boroughs ran shivering to the branch post offices, "queuing up" in long lines to wait their turns to pass the government their ten shillings for a slip of paper guaranteeing them protection and peace from the stern vans which so inexorably sought them out. The radio detectives went to Oxford, to Cambridge, to Dundee and Glasgow, and from John o' Groat's to Land's End, heralded far and near by the ever vigilant press and the ubiquitous newsreel. And in Glasgow and in Plymouth, on the Isle of Wight and on Clydeside, the lawbreakers fled to cover themselves with licenses. At the end of about two weeks, an announcement was made that some thirty to forty thousand new licenses had been taken out, and that the radio vans were really proving themselves effective. They had, in other words, made perhaps, £20,000 (nearly $100,000, at par value) for the Post Office and the B.B.C. to split between themselves; and they had installed a proper respect for the law into many hitherto unpatriotic British breasts. Whereupon for a moment they dropped from the public eye. Until suddenly the public began to take note of the mutterings of a few cynics who had from the first said they did not believe that any such vans could be built. How, said these cynics, could anyone detect a receiving set? Of course, they might wait until some set oscillated, and then take a "bearing" on it. They would then move along 100 yards or so and wait until the set oscillated again, and take another bearing - "Oh, yeah?" (they are using that expression over here now, thanks to the American talking films.) "That would be just fine; but by the time they had gotten to another spot, the chances were that the listener would have tuned off. Anyway, he would not still be oscillating. They might, of course try to tempt him to oscillate by doing a bit of fancy re-radiation themselves; but that would bring in perhaps twenty people in all the London area - and probably eighteen of those would have licenses anyway." So the secret seems to be that the vans were just used for the publicity they could obtain. At least, the British public is getting very suspicious that it has been badly hoaxed. It is true the van riders rolled merrily along the residential streets twirling their frame aerials and looking fierce, but in reality they listened carefully for any sounds of radio broadcasting that might come through open windows. It has been a fairly mild Fall in England, and the British are fresh-air fiends. They keep their windows open until the last possible moment. Even an amateur detective might be able to learn that some house was equipped with a radio set; and it would not need a remarkable pair of ears to trace it down. It is reported that the van riders went into houses, after listening at doors and windows, whenever they heard strains from a radio. Anyway, the B.B.C. and the Post Office are rubbing their hands over a tidy sum of delinquent license fees; and the English people, who, in spite of all American belief to the contrary, are quick to see a good joke on themselves, are chuckling at their own gullibility in not even questioning how these vans could find them - the while the Post Office says it has something even bigger and better in the way of "radio van" now coming out, which will detect any metal antenna of over six inches long. With which, one journalist opines, they will find a wonderful amount of drain-pipes, eaves-troughs, and household plumbing.